Right Up My Street: Superbreak Competition || Paris Autumn Getaway..
Superbreak Competition || Paris Autumn Getaway.. I got asked to do something a bit different on the blog recently.. I've been offered to enter a competition with Superbreak to be in with the chance to win a city break for 2 to Paris, with 4* accommodation and travel aboard the Eurostar included. Seriously now - all aboard!! Now frankly this is all quite weird (maybe even fate) because I've been talking alot lately about how I'd love for my boyfriend Alex to whisk me off to Paris this October for my birthday. Obviously this is a big ask and very much a dreamy, I know this is unlikely to happen one! So as you can imagine when I saw the lovely Lauren & Claire at their blog Stylingo had entered this competition for such a dreamy prize I was immediately pining for this lavish trip! I was asked to create an outfit idea for what I would wear upon my Autumn City Break to Paris. I have come up with both a Daytime and Evening Outfit. I've gone for the whole theme of camel brown, burgundy and black which I think are perfect autumnal colours. I'm loving the Oversized Boyfriend Coats that are available and on trend at the moment, this would be the perfect snug item to keep the chilly air at bay. A fedora hat is perfect for a weekend away as it can be dressed up or down, hence why I've used it in both my day and night outfits. I've had my eye on this Spike Fedora Hat for a while now from Missguided. The watch is very Parisian Chic and a vintage oversized design. This is already on my birthday list! The sunglasses, I thought were a great twist to the whole outfit as they are very eye catching and of course one of our top priorities should be keeping glam at all times during our flash trip to Paris! The Tartan dress just fits in perfectly with the entire colour scheme of the outfit, and of course being bang on trend for A/W its a really nice match with the stylish burgundy bag that is both a great shopper, aswell as a carry bag as its got both handles and a shoulder strap! My evening attire would be the above, again with some slightly similar items, of course we need to remember, were only going for a weekend City break so it can usually be quite limited to what were allowed to pack! Its always ideal to travel lighter incase you strike lucky and find some Paris bargains to bring home! Again I've gone for the Topshop Camel Boyfriend Coat as this is great for the colder night, while still being a very fashionable item! As you can see I've chosen another Smock here, I am a big fan of Smocks, they are ever so flattering and completely food baby friendly! (hahaha). The best part is they are very cute and can again be styled up or down. Easy enough to wack on with a nice pair of thick red tights or some leggings for an extra chilly evening. And now I know what your probably thinking... what on earth would you pack! I think it's always so important to pre-plan your carry around the city / carry on bag for the plane... there's no time for mis-packing handbag essentials. Packing is always such a tedious process, while we are super excited for our getaway there's no denying the fact 'we can't go until we have the bag all packed!'. So maybe your heading off for a little city break this A/W and are slightly stuck on what really is an 'essential' piece? Don't you fret, I've put together a little collage below outlining my handbag essentials and hopefully this will help both you and I to decide what to take.. Sounds like a fab place to do after dinner cocktails and people watching on the sly. Also the thing I love about big fashionable cities is that I can admire all the hip and trendy! Looks like the perfect spot for some alfresco evening dining! Looks rather romantic eh? 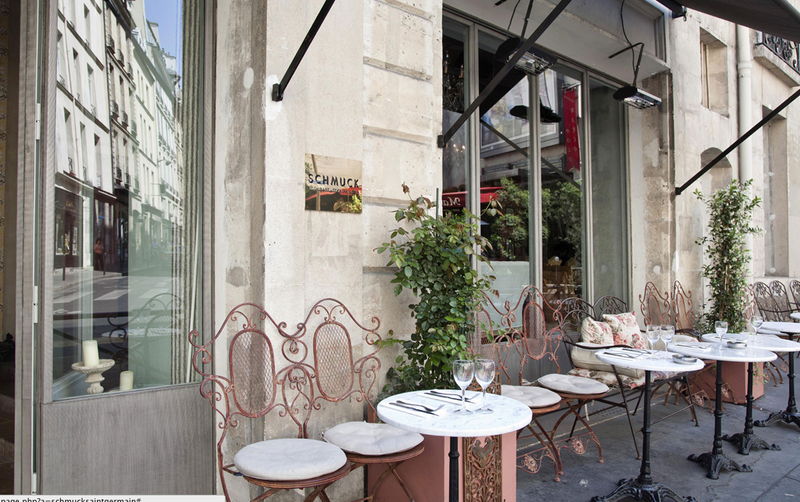 This restaurant is in the heart of Pigalle and tends to be full of young hip Parisians dining and having cocktails on the outdoor patio. Apparently its the ideal location for spotting a French Movie Star! It's been decorated in a retro 50's style, with a classic French bistro style menu, you'll find me here munching on a true burger and french fries! - the monument of love La Eiffel Tower! Are you planning a city break this Autumn? Why not check out Superbreak's website, they have an array of lovely City, Countryside, Seaside and Oversea's Breaks to offer! This blog post is an entry into a competition ran by Superbreaks to win a weekend away, which I would love to have the opportunity to be considered for winning so I can infact surprise my boyfriend and whisk him away instead (obviously I would still reap a massive benefit!). What a great post! So much information and French inspiration. I love the outfits you came up with. The smock dresses are so pretty, I really want one for autumn now (after seeing them here). I also like the burgundy bag and the cute sunglasses. Following you on Google+ now. great outfits chick, love the coat. good luck!